They grew tired of the dark and decided to move out. The members of the first expedition didn’t survive. They didn’t know how to catch food in the outside bright world. A few members were able to report back, but died shortly after. They needed an adaptation strategy. They thought of different possibilities, but it was no use. All they knew was to glow and grow. Glow a beautiful light to attract prey and grow webs to catch them. But how to do that on a world already full of light? This post was written in response to the Friday Fictioneers of January 5th 2018. The photo prompt is courtesy of Roger Bultot. 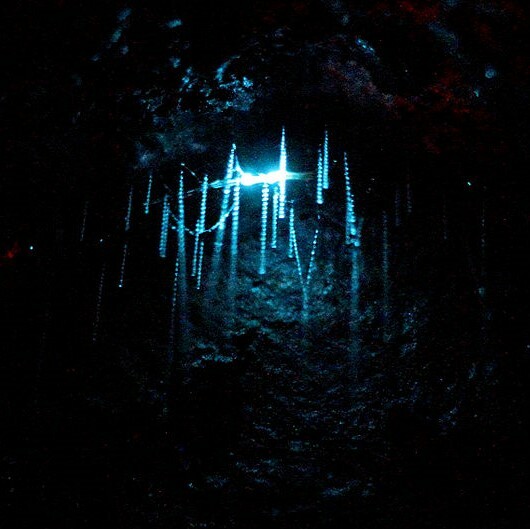 When looking closely at the picture, seeing that each tube had different sizes, the image came to my mind of the glowworms that exist in the depths of some caves in Australia, and decided to write about them. Three genera of fungus gnats are bioluminescent, and known as “glowworms” in their larval stage. They produce a blue-green light. The larvae spin sticky webs to catch food. They are found in caves, overhangs, rock cavities, and other sheltered, wet areas. They are usually classified under the family Keroplatidae, but this is not universally accepted and some authors place them under Mycetophilidae instead. Despite the similarities in function and appearance, the bioluminescent systems of the three genera are not homologous and are believed to have evolved separately. Genus Arachnocampa – around five species found only in New Zealand and Australia. The most well-known member of the genus is the New Zealand glowworm, Arachnocampa luminosa. The larvae are predatory and use their lights to lure prey into their webs. Genus Orfelia – sometimes known as “dismalites”. Contains a single species, Orfelia fultoni, found only in North America. Like Arachnocampa spp., their larvae are predatory and use their lights to attract prey. Genus Keroplatus, – found in Eurasia. Unlike Arachnocampa and Orfelia, the larvae of Keroplatus feed on fungi spores.Their bioluminescence is believed to have no function and is vestigial. He was lost in the desert, dehydrating and hungry. Cacti was tempting with their water reserve, but the thorns were so tough! He was about to give up when he came across a baby cactus with small thorns, that would pierce his skin just lightly. With his thirst finally quenched, he walked onward until he found a rattlesnake. Snakes were his most dreaded animal – hideous, scary things! The viper was on him, looking intensely, about to pounce. Heart racing, he was faster and before she closed her fangs onto his skin, he grabbed her and had a bite, satisfying his hunger. 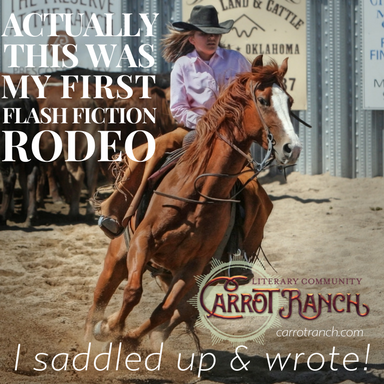 This post was written for the Flash Fiction Rodeo Contest #6. To enter the contest this week we had to do it in 2 steps. First, we had a couple of days to sign up to it. 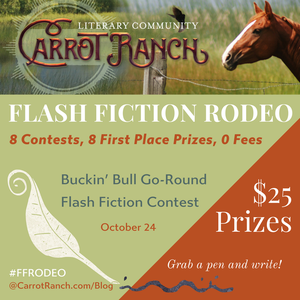 Then, a 2-word name of a bucking bull would be drawn for each contestant, which would then have another couple of days to come up with a 107-word 8-sentence history that included the 2 words of the bull’s name. And the theme was to be a fictional story about someone facing a challenge or a fear. I liked the title of my bull and decided to keep the words together in the same order, so I created a story to go around it. Congratulations to Kerry E.B. Black!